To access Invoices from the menu bar of the main TeleTracker Online screen, click Transactions, then Invoice. Click the New icon to create a new Invoice. TeleTracker Online will then prompt you with the following window. New : Selecting New will begin the process of creating a new Customer Master File. You will be prompted with the Customer Search window. Entering the Social Security # or Phone # will check the TeleTracker Online database for any duplicates. If none are found, TeleTracker Online will search the whitepages. You will then be asked to complete the Customer Master File. 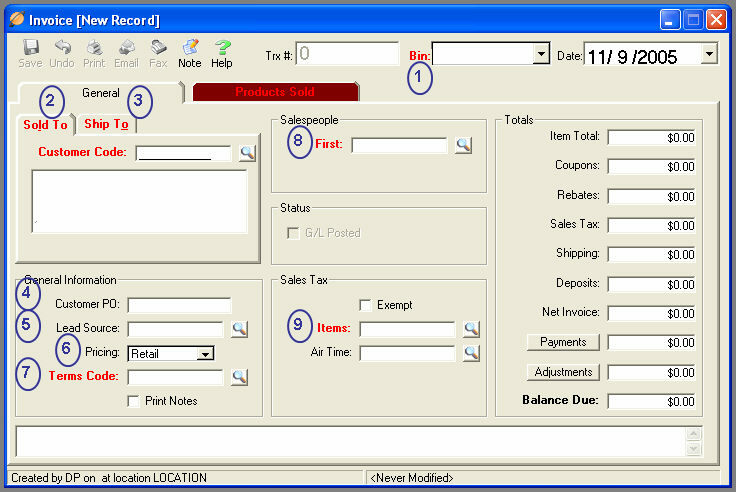 Once the Customer Master File is saved, you will be taken to the Invoice window. Existing : Selecting Existing will bring up the Customer Lookup Utility. When the appropriate customer is selected, you will return to the invoice. Walk-In : **Select the Walk-In button when selling items that do not require detailed customer information. (1) **Select the appropriate Bin in order to sell products from. Bins are containers that hold inventory. Only one specific Bin can be selected for an invoice. Visit the Master Files > Locations help page for more information on Bins. (2) Enter the Sold To Customer Code. To perform a lookup and choose from existing customers, click on the lookup button to the right of the Customer Code field. You may also add a new Customers Master File directly from this screen by clicking on the New icon in the upper left-hand corner of the screen and following the prompts within TeleTracker Online. (3) Enter the Ship To Customer Code. TeleTracker Online allows you to bill items to one customer while shipping them to another. To perform a lookup and choose from existing customers, click on the lookup button to the right of the Customer Code field. You may also add a new Customers Master File directly from this screen by clicking on the New icon in the upper left-hand corner of the screen and following the prompts within TeleTracker Online. By default, the Sold To Customer Code will populate the Ship To Customer Code. (4) If applicable, enter the Customer PO (Purchase Order) number. (5) **Enter the invoice’s corresponding Lead Source Code. To perform a lookup and choose from existing Lead Sources, click on the lookup button to the right of the Lead Source field. You may also add a new Lead Source Master File directly from this screen by clicking on the New icon in the upper left-hand corner of the screen and following the prompts within TeleTracker Online. Lead Sources are used to identify each of your business generating sources. These sources might include newspaper advertisements, flyers, or referrals. (6) Select the appropriate Pricing Level. TeleTracker Online will automatically populate the Pricing field with the default Pricing level identified in the Customers Master File. Retail and Wholesale Pricing assignments are set within the Product Master File. (7) **Enter the invoice’s corresponding Terms Code. To perform a lookup and choose from existing Terms, click on the lookup button to the right of the Terms field. Terms are used to identify the payment conditions for the customer. (8) **Enter the corresponding Salesperson Code. To perform lookups and choose from existing salespeople, click the lookup button to the right of the Salespeople field. You may also add a new Salesperson Master File directly from this screen by clicking on the New icon in the upper left-hand corner of the screen and following the prompts within TeleTracker Online. (9) **Enter the invoice’s corresponding Items Tax Code. With the exception of non-taxable products, the code entered in this field will apply to all products sold on the invoice. To perform a lookup and choose from existing Tax Codes, click the lookup button to the right of the Items Tax field. You may also add a new Tax Code Master File directly from this screen by clicking on the New icon in the upper left-hand corner of the screen and following the prompts within TeleTracker Online.